Vandersoft has created an app to coach you through each Wendler 5/3/1 workout on your iPhone/iPod or Android device (Samsung, HTC, LG, Motorola, Google, etc). 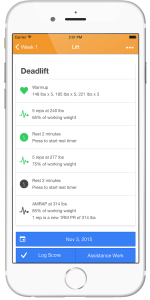 When we create apps, our goal is to build a tool that you can understand and use for the entire time you are doing your exercise program. We’re here to help you build muscle and get stronger as quickly as possible, in a safe manner. 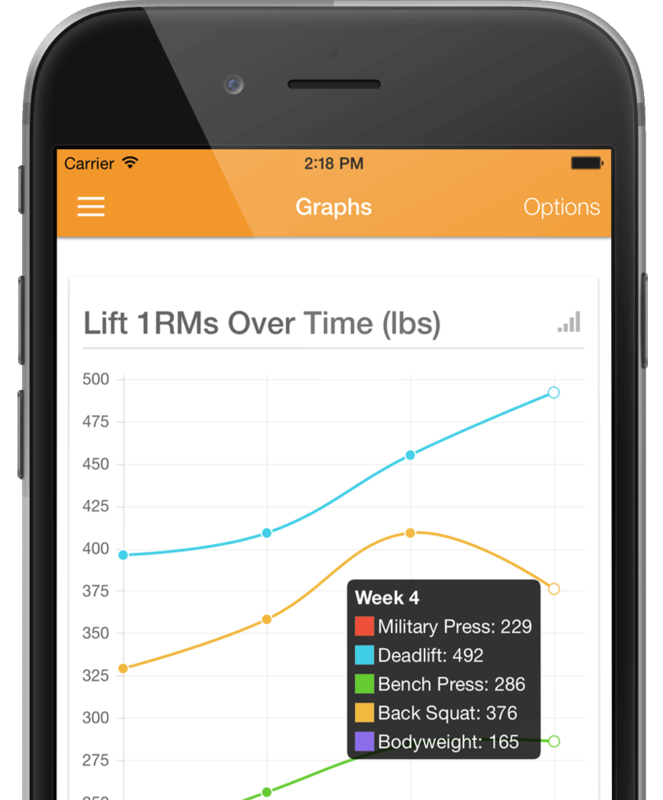 The Wendler 5/3/1 app tells you which exercise to do each workout, with how much weight and how many sets & reps. It also tells you how long to rest between sets. 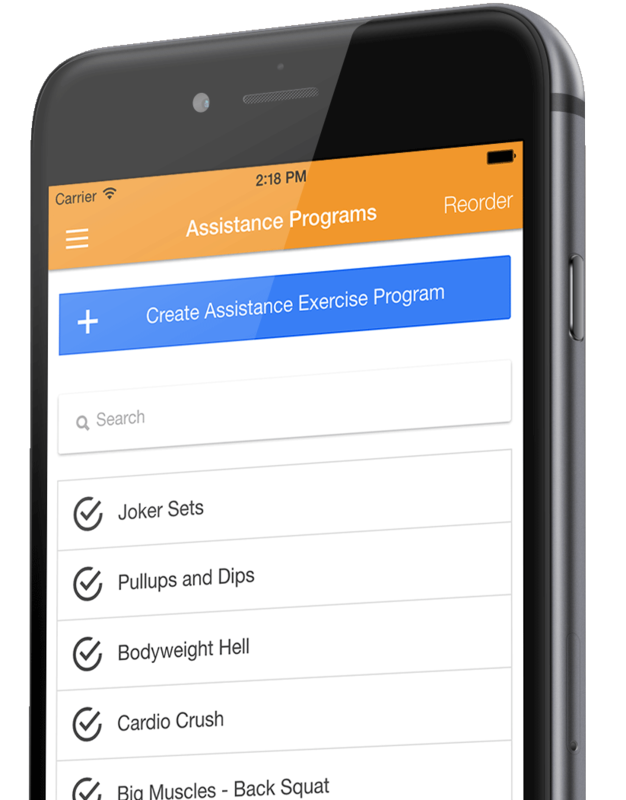 The Wendler 5/3/1 app is like having a personal coach – but in your pocket. Please note this app is not connected to Wendler himself, the creator of of the Wendler 5/3/1 program. Get started by entering your one rep maxes for your military press, deadlift, bench press, and back squat into the second introductory screen. The weights you enter here will control how heavy your lifts are each workout. Each week in your Wendler program will be a different percentage of these starting weights. Don’t worry, if you want to increase or decrease the weight later you can. The key here is to start with lighter weights. 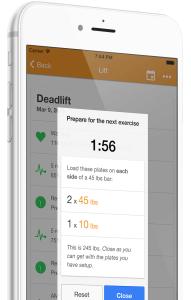 These weights will automatically increase over time. If you start too heavy you’ll only prevent yourself from getting a good workout with proper technique and form on your exercies. Do yourself a favor and start with your true one rep max for that exercise, not what you think you can lift. If you skip the intro your one rep maxes can be entered under Settings. Once you have the Wendler 5/3/1 app setup and your first cycle created, it’s time to being your first workout. By default the first exercise in the lineup is the Military Press (this can be changed under Settings if you want). Begin with the warmup sets at the top. The warmup sets default to 40%, 50% and 60% of your training weight (your training weight is 90% of your 1RM). Once you’ve warmed up continue down to your first set of 5 reps. After completing your first set, press the “Rest 2 minutes” button to start your rest timer. If you want to adjust how long your rest time lasts take a peek at the app Settings page. When you get to the last lift on the screen, the AMRAP lift, this is where you go all out. Lift the weight until you can’t lift it anymore. If you can do 15 military press reps of the military press at 77 lbs, lift that barbell 15 times! 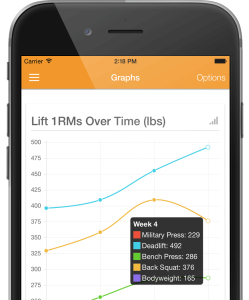 Once you’ve logged a score for an exercise the Wender app learns what your calculated 1RM PR (personal record) for that lift is. The app will tell you how many reps you need to beat your previous record. 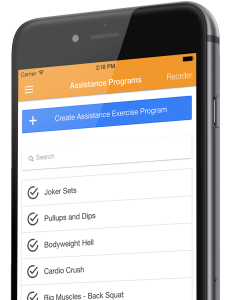 The Vandersoft Wendler 5/3/1 app is packed with 11 pre-built assistance exercise programs that you can customize to your liking. After completing your workout press the ‘Assistance Work’ button to begin the assistance program of your choice. You can mix and match the assistance programs throughout your cycle. If you don’t like an exercise we’ve put in into one of them you have complete control to edit them under the ‘Assistance Programs’ area. 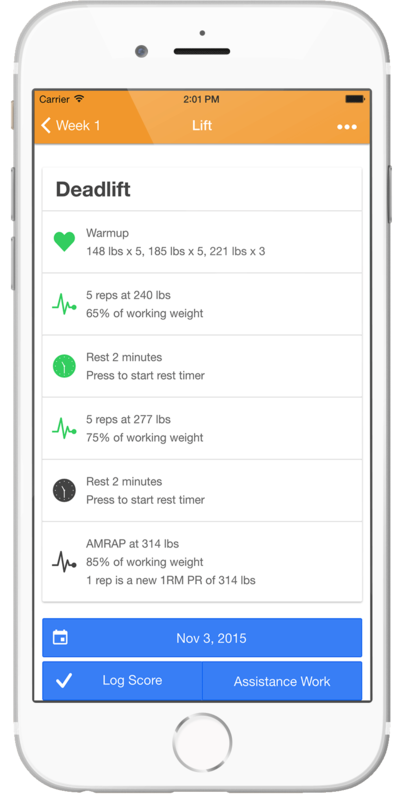 You can customize rest timer length, exercies, weights, reps, sets and more. Read more on Wendler Log assistance program setup. After you’ve completed 2 weeks of lifts you can view a graph of your one rep maxes over time. You can also graph your bodyweight in comparison to your strength to see how your weight correlates to your strength over time. If you want more detail than the graph, the History screen displays a detailed log of your reps, weights, and calculated one rep maxes. You can also export your program history to an email to share with your coach or lifting partners.